HONG KONG, Jan. 30, 2019 /PRNewswire/ -- gini, the Hong Kong-based smart spending-tracker announced today that it has successfully completed its seed round with a US$1.6 million investment from both international institutions and Hong Kong-based Vectr Ventures, the early stage fintech venture capital firm. The co-founders, CEO Raymond Wyand and COO Victor Lang revealed the funding will support a global roll out plan, with gini's aim to be compatible with over 3,000 overseas banks in 60 countries by the second half of 2019 - starting with over 60 banks across Hong Kong, France, Switzerland and the UK currently available. "We are Hong Kong based, but the plan was never to launch an app only for the Hong Kong market," explained Wyand. "We live in a globalised world. Ultimately, our goal is to build a truly worldwide financial marketplace, to service not just a user's home market but make managing money across markets accessible and easy for anyone to do. This new seed round allows us to start making that vision a reality, and we have a strong new partner in Vectr who shares our passion and believes in our vision for what gini can do to disrupt the global personal finances industry more broadly, and make financial freedom accessible to everyone around the world." he added. With its soft launch in March 2018, the app already has more than 20,000 users in Hong Kong and has handled over HKD 6B in transactions so far. 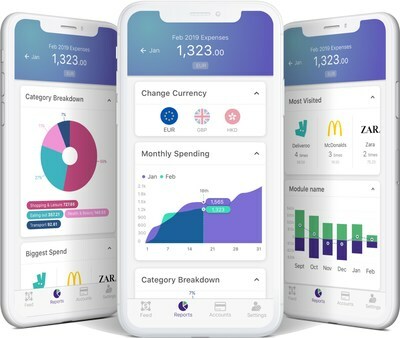 The first batch of available countries includes the United Kingdom (38 institutions), and France (11 institutions) and Switzerland (6 institutions) based on current user demand, with more banks to be added in the first half of 2019.
gini is a smart spending-tracker enabling each and every person to keep track of their finances, effortlessly. It's an app using bank-level security to allow people to bring together all their accounts and credit cards in one spot. gini provides a tool for handling personal finances efficiently. By giving valuable and detailed insights, gini is on a mission to empower people to take control over their finances.